Peace, quiet, and stitch. that's all we sewers want! Not sure why this happens, but as soon as we shut the door to our sewing studio or sewing room. knock. knock.Mom! Or perhaps you hear - honey, grandma, or I'm hungry - when is dinner? The Sewing. Do Not Disturb door hanger is the perfect solution to this problem. If your family needs you, train them to stop, grab the pencil (from the bottom ribbon) and write a note on the sheet of paper (located in the pocket). Nice and easy, and then you can stitch in peace. 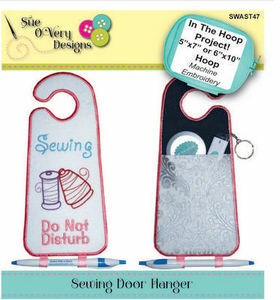 Features the door hanger precuts by Bosal. Learn these new techniques: Tricks on creating a door hanger ITH, Attach a pocket and create a crisp pocket top, Add ribbon for pen holder, two sizes available. Final dimensions: Small - 4in wide x6 3/4in tall.